As a breastfeeding mom that works outside my home I have to pump in order to provide Evan the milk he needs. It is not my favorite part of nursing, but very important to provide all the nutrition he needs. On a daily basis I pump 3-4 times. I usually pump at work 3 times and often again at home in the evening after Evan goes down. Although it is not fun to pump I have found a product that makes pumping easier. Its called Simple Wishes Hands Free Pumping Bra. Simple Wishes Hands Free Pumping Bra helps to free your hands while pumping. This bra makes pumping so much easier. It holds the pump horns in place while pumping. That frees your hands up to do anything else you need to do. The bra has a zipper down the front middle to put it together. It has velcro in the back to adjust sizes. It comes in 2 adjustable sizes, either XS-L or L-Plus. This is great for the ever changing size nursing mamas go through. It also comes with straps in case you want to add straps, but they are not required. Taking time out while at work to pump is not always easy. My company is great and all about giving me the time and a space, but sometimes I have reports to do or other things I am working on. What I love most about the Simple Wishes Hands Free Pumping bra is the fact that it truely is hands free. I can put it on and just let go. I often take my work laptop with me to the pump room at work and I can type up my reports or do anything I need to while I pump. The bra also covers me pretty well with just the horns of my pump sticking out so if someone was to accidentally walk in on me I am not just hanging out there. Occasionally I have to pump at home here and there. When I do it never fails that either Evan wakes from his nap or just wants my attention. By wearing the pumping bra I can hold him and continue pumping. I don't have to stop or worry that he will kick or knock everything off of me. When Jayden was a baby I exclusively pumped for him and I would have LOVED to have one of these. I really wish I knew there was a such thing. I would have to hold it all in place every time I pumped and be careful not to move the horns or spill anything. I don't know that I will ever love pumping, but I do love this bra. It makes my life so much easier as a pumping mom. Simple Wishes has so kindly offered the same great products that I received to be given away during the Spring Fever Giveaway Hop to one Arizona Mama reader. For extra entries in the giveaway visit Simple Wishes and tell me on this post what you like or learned. 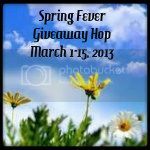 Then hop over to the rafflecopter form on the giveaway hop post and click I did it. Thank you to Simple Wishes for sponsoring this review and giveaway. I like that you can quickly put it on and it doesn't need straps! i can see how something like this would be so great for a pumping mama. i love these, so easy to put on and adjust. I like that it can be adjusted in size as your body size changes! I like that it goes from XS to Large! I'm always small, but when i was nursing got a few sizes larger, but back to normal near the end of my nursing my first daughter. This would be great. i learned that many celebs use simple wishes! I learned that you can adjust the size. This is so important for comfort.